Levitical (g. by Not a Single Doubt). 5 wins to 1150m, A$119,624, to 2018-19 in Aust. 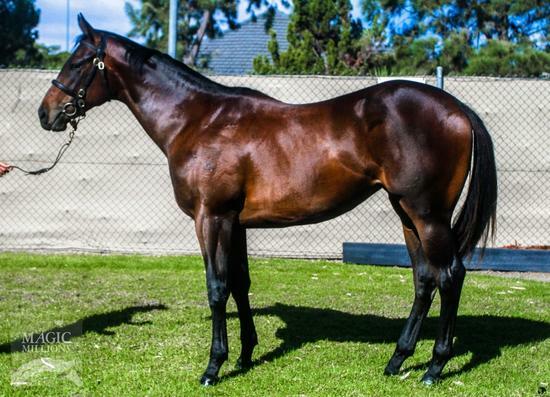 Hard Merchandise (g. by Hinchinbrook). 2 wins at 1200m, 1300m in 2017-18 in Aust. Solchow (Statue of Liberty). 6 wins. See above. Daymo. 3 wins from 1300m to 1600m, A$107,725, ATC Australian Turf Club H., 3d ATC Royal Randwick H., Luskin Park De la Salle Reunion H.
Truvic. 12 wins from 1400m to 1800m, A$86,117, 2d Carnarvon Cup. Three Up. 3 wins at 1000m, 1200m in Aust. Black Chandelier. Winner at 1600m in Aust. Mana Girl (Sumayr). 5 wins from 1200m to 1600m, A$83,760, SAJC Kingston Town H., VATC St Clair H., SAJC Iced Coffee Gold H., Bali H., Special H., 2d VRC Flag International H., L, SAJC Alan Darby H., Spirit of Kingston H., 3d SAJC Galaxy Television H., Helen Montagu P. H., Wormald Security H., Rising Fast Welter H. Producer. Zoffany's Glow (Zoffany). Winner at 2, STC Very Merry 2YO H., 3d AJC Keith Mackay H., L, City Tatt's RC A Punch H. Producer. CLAN O'SULLIVAN (Zoffany). Top colt on The 1991-92 Australasian 2YO Classification. 9 wins-8 at 2-to 1400m, A$1,762,540, STC Todman Slipper Trial S., Gr.2, ACT RC Black Opal S., Gr.2, GCTC Magic Millions 2YO Classic S., RL, STC Oceanside H., GCTC Australasian 2YO Classic, ACT RC Black Opal Preview, 2d STC Golden Slipper S., Gr.1, Star Kingdom S., Gr.3, AJC Brian Crowley S., L, QTC Bretts Timber & Hardware H., 4th AJC Hall Mark S., L.
BURNING EMBERS (Zoffany). 5 wins from 1200m to 2000m, A$267,925, MVRC Diamond Jubilee S., Gr.2, VATC Eclipse S., Gr.3, SAJC Bloodstock Insurance H., STC Epona P., 2d MVRC Tesio S., Gr.3, VRC Matriarch S., L, SAJC Stuart Crystal S., L, MVRC Fantastic Flowers H., Lady Jakeo H., 3d VATC Mannerism S., Gr.3, 4th VATC Mercedes-Benz S., L. Producer. HONOR LAP (Honor Grades). 3 wins at 1400m, 2400m, A$366,385, WATC Derby, Gr.1, Western Australian Oaks, Gr.2, WATC Capel Hare H., 2d WATC Burgess Queen S., L, Joondalup Wanneroo Community H., Natasha Trophy, 3d WATC Champion Fillies S., Gr.3, York S., L, Ascot One Thousand Guineas, Mercedes A-Class 2YO H., Marscay 2YO H., Rare West H., 4th WATC Sheila Gwynne S., L. Producer.